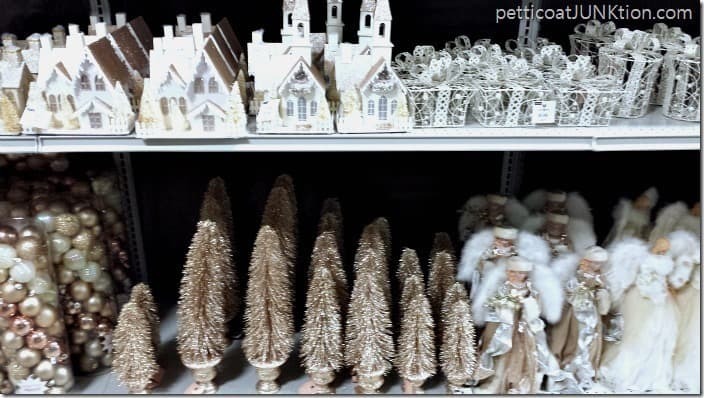 My favorite store this holiday season is At Home. At Home Christmas Decor has 15 beautiful themes. I like them all! I also like to mix and match themes. 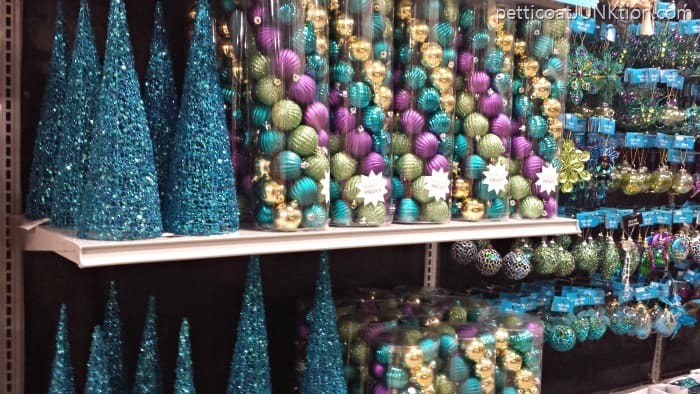 I bought a few things from my local At Home store to add to my existing decorations. Isn’t that owl just the cutest! 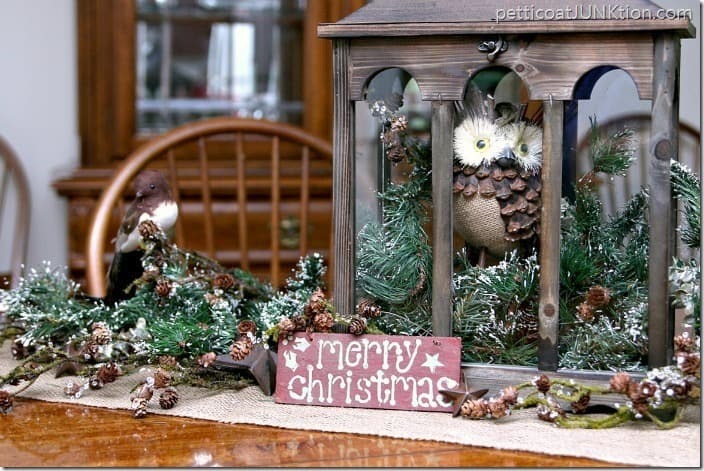 The small colorful bird is from the Holiday Hoedown Collection. 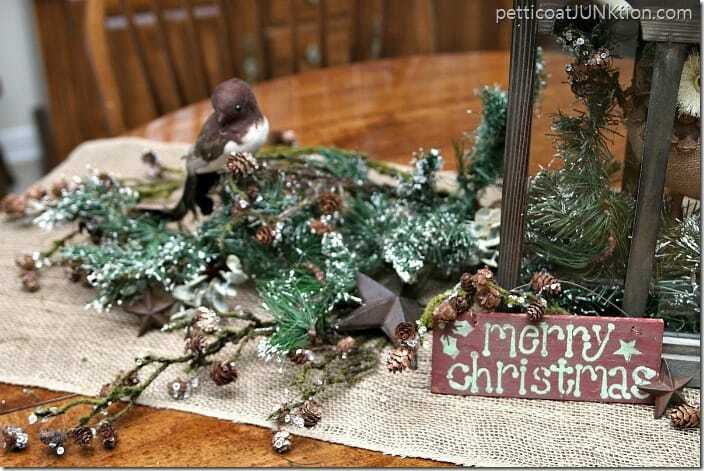 Although I have faux greenery from years past I couldn’t resist getting a few of these branches. The moss cover looks soooo realistic. I bought the Lantern/Led Candle Holder from the home décor department. At Home isn’t just a holiday décor store. It has décor for every room of your home. One stop does it all. 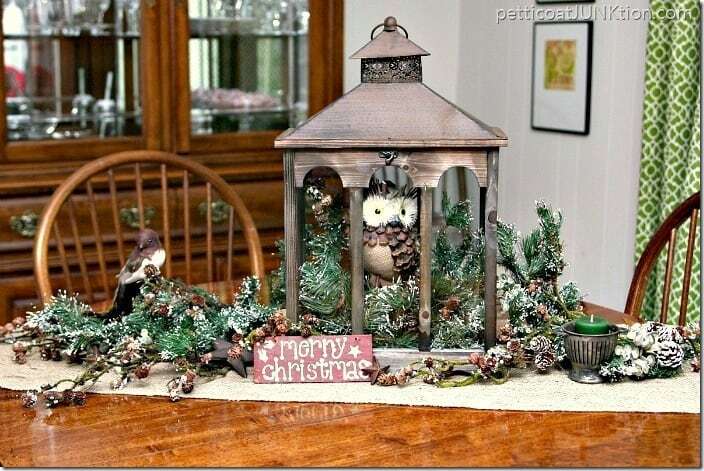 The lantern is a piece I can use year round. I like that idea. 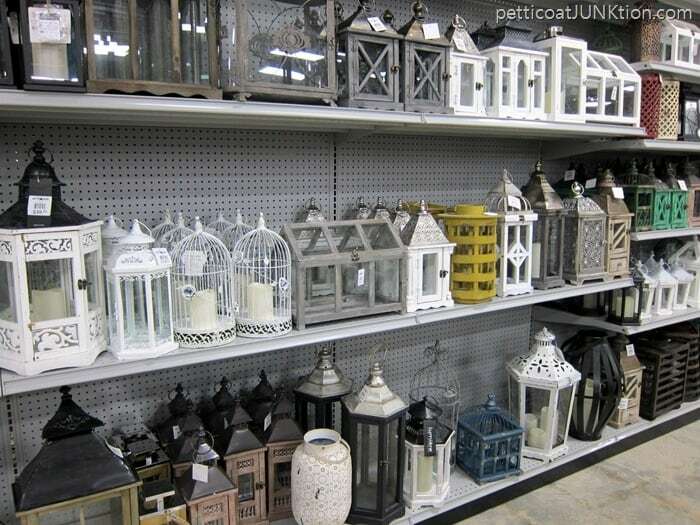 I may put LED candles (my favorite kind) in the lantern next and I may use the lantern in a Valentine’s Day display in February. Who knows after that. 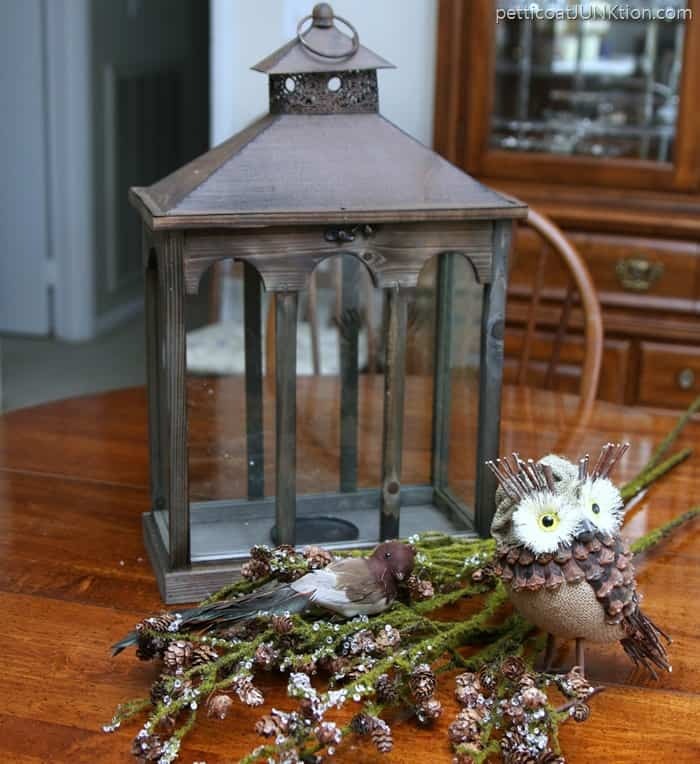 I put together my dining table centerpiece adding a few of my junky finds to the table display. 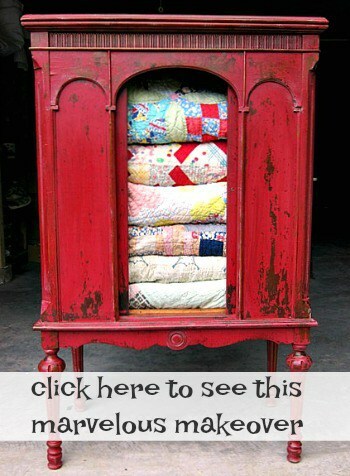 You guys know me…..love those junk treasures. See how pretty the new greenery looks nestled among the old stuff. Really spruces it up. 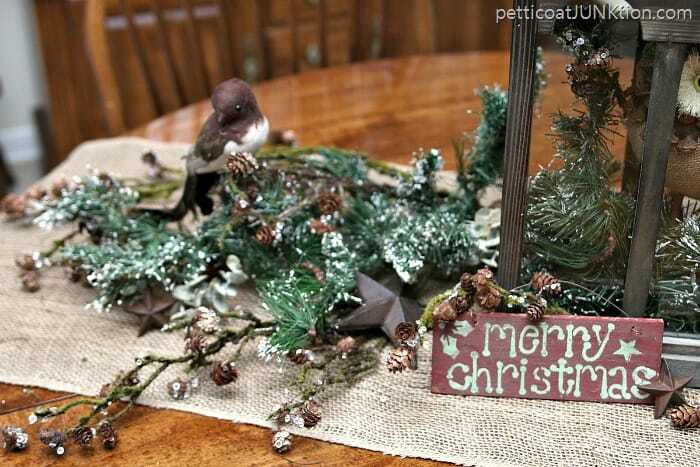 The Merry Christmas sign is a DIY from a few years ago and the rusty iron stars are a fun touch. 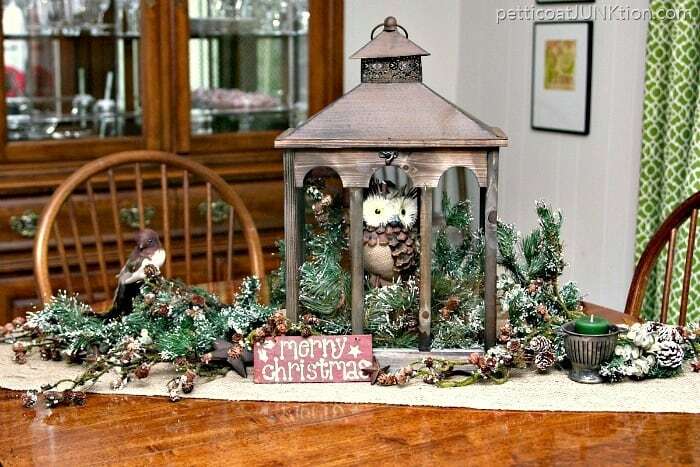 I added a few stems of greenery to the lantern and dropped in the owl. Done! If you aren’t familiar with At Home, let me introduce you. Can you see why I had a problem selecting a lantern. 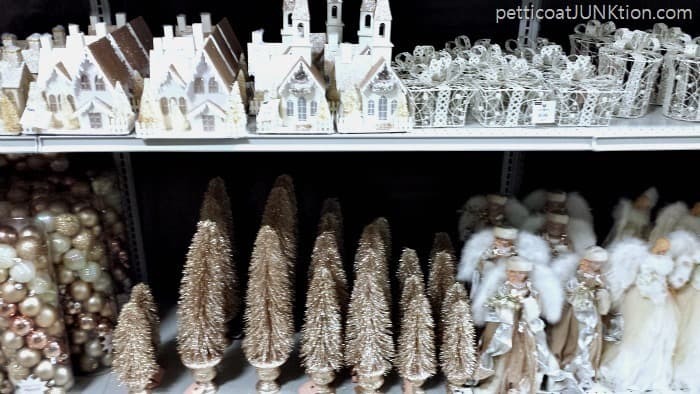 I bet I stood in front of this display for 15 minutes. Decisions, Decisions. If my home décor centered around neutrals and whites I would have everything in this display! I’m still thinking on that white tree. It would work in my bathroom. It’s a good thing Sofi wasn’t with me or we would have been riding home with a reindeer. I can just see it now…back seat….belted in. Sofi takes a doll or stuffed animal with her every where she goes. Champagne colors and glitter, glitter, glitter. If I wasn’t going with the natural look this year those trees would be mine. 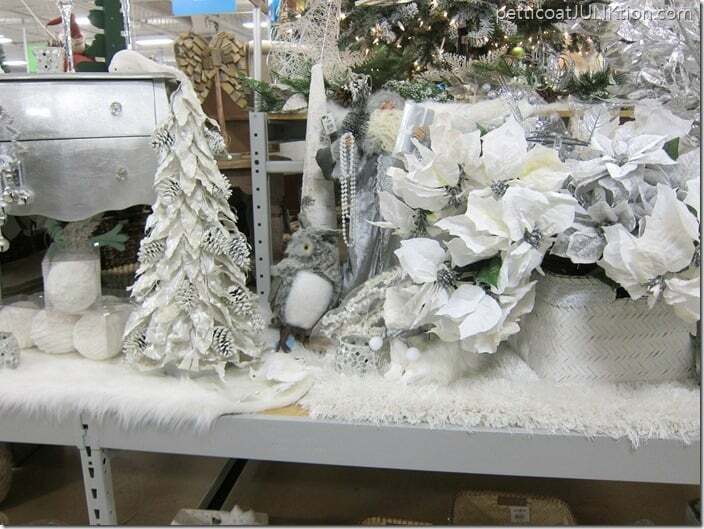 The trees are part of the Lavish & Luxe Christmas theme. You can see all 15 themes here. 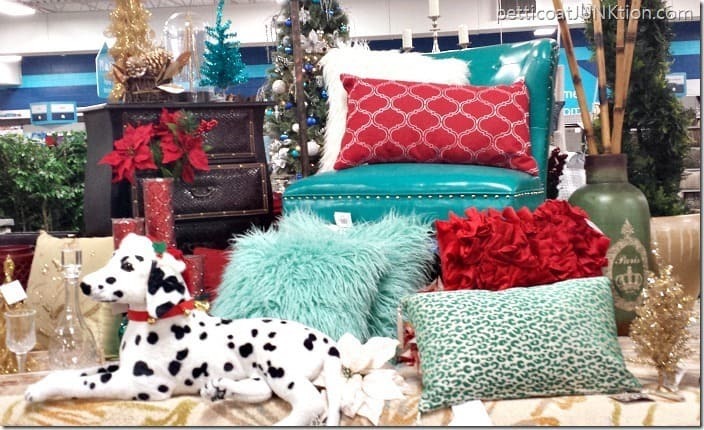 The 15 themes include everything from ornaments to dining décor items. How fun is this. 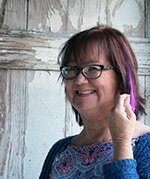 Red and turquoise are one of my favorite color combinations. I really like that chair. When I get ready to redecorate our master bedroom I’m heading to At Home. Their everyday low prices are hard to beat. I truly love sparkle and bright colors. 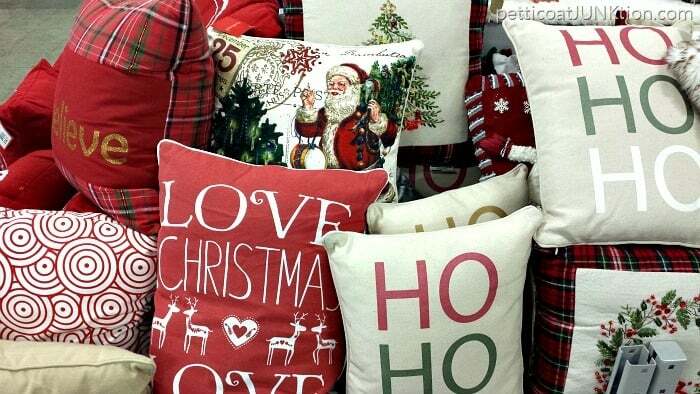 Pillows soften any décor. I may need one of those too. 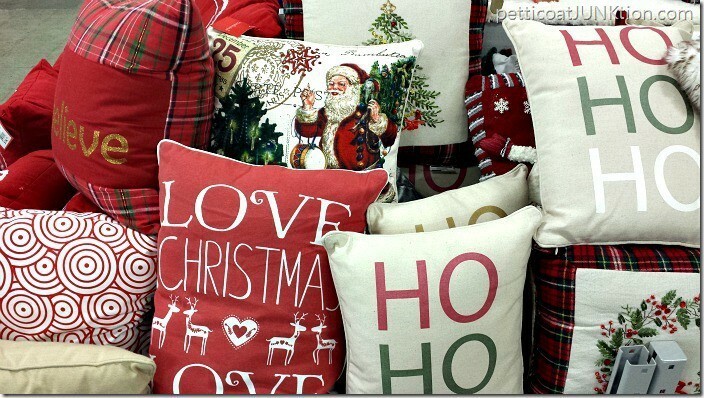 The deer on the “Love Christmas” pillow are so sweet. I also like the metallic “Ho Ho Ho”. 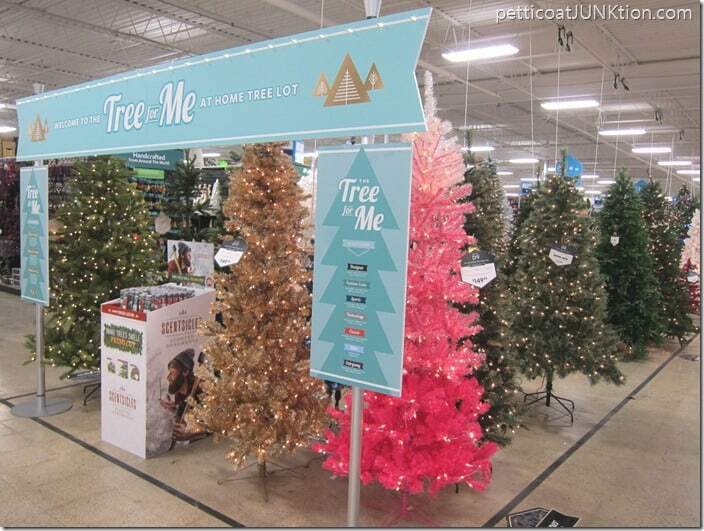 The Tree for Me section has over 101 varieties of Christmas Trees. 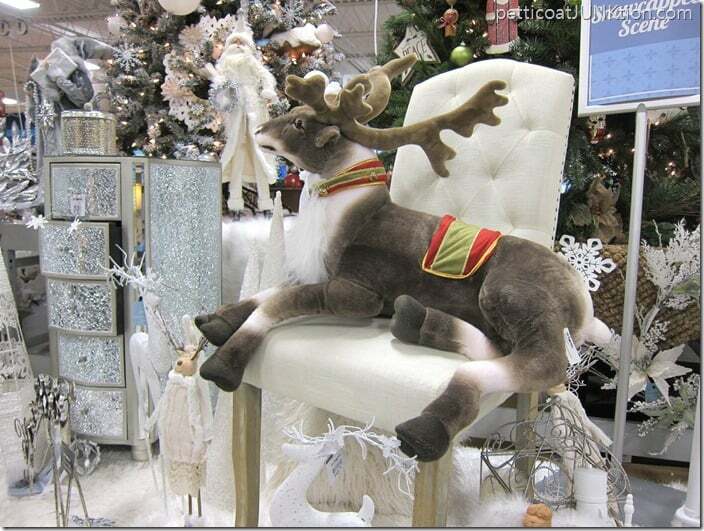 At Home also has a large collection of outdoor décor items for Christmas. 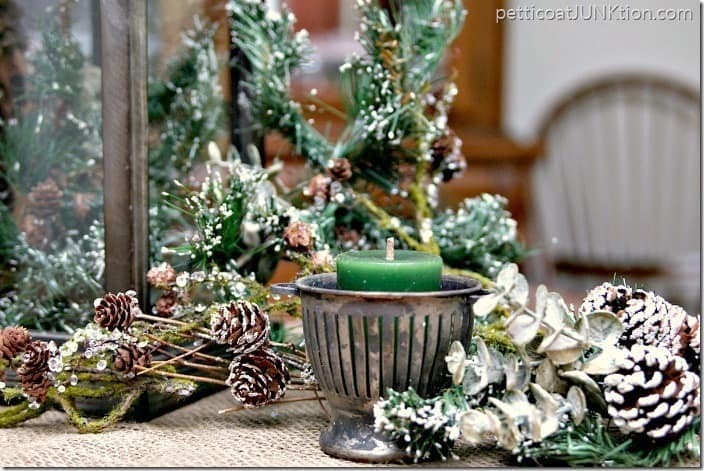 What do you think of my Christmas centerpiece? 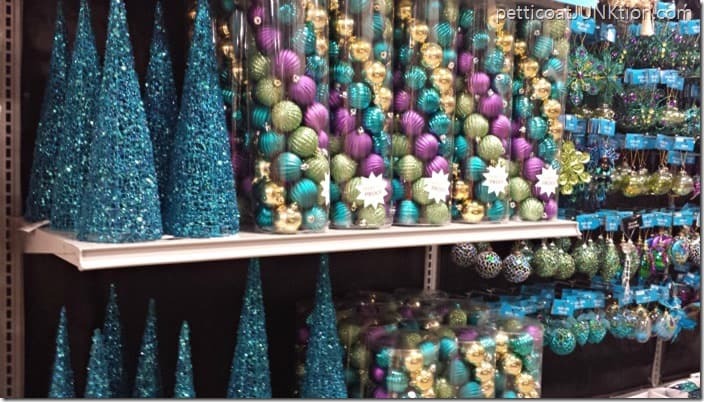 Do you add new decorations to your existing ones each year? 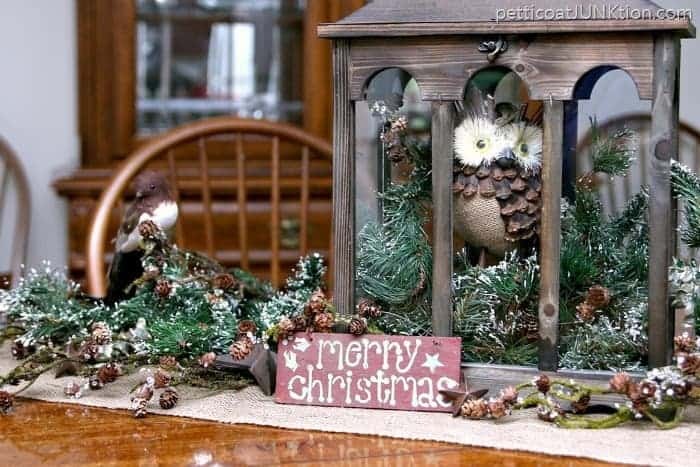 Kathy, your Christmas centerpiece is lovely. Does this store have a website where I can order? I’ll have to check that out. Looks like my kind of store!! Thank you for sharing on Idea Box. This will be featured on my blog this Thursday! I love At Home!! Such a fun store. Every time I go, I walk up and down every single aisle…and even if I need nothing, I usually walk out with at least a couple things. 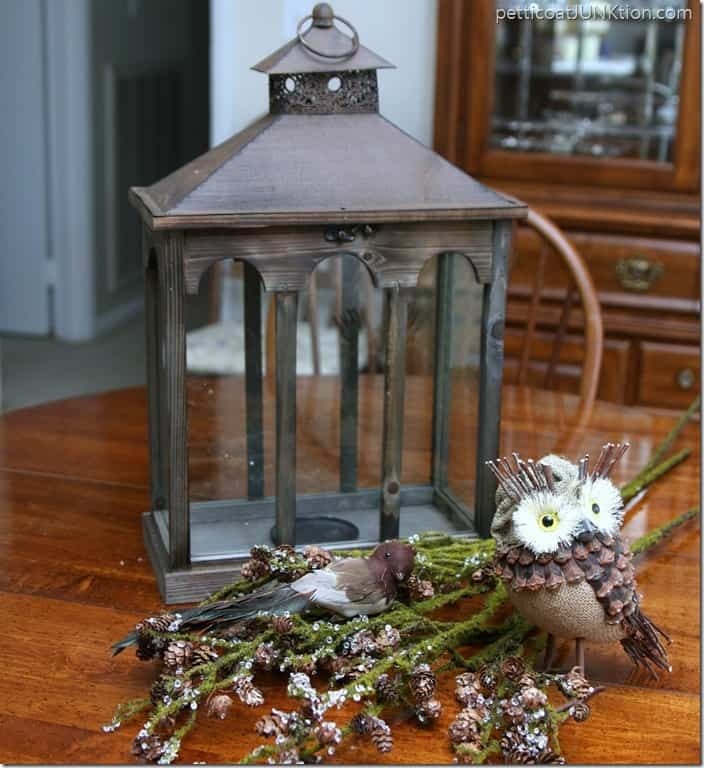 Thanks for sharing this beautiful centerpiece! Going to pay that store a visit today! Thanks for sharing! This post is a fave for Wake Up Wednesday this week! Thanks again.